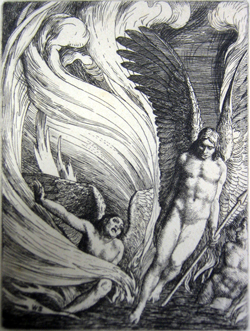 Since its first illustrated edition rolled off the press in 1688, Paradise Lost has fired the imaginations of artists. Generations of painters, draughtsmen and printmakers have tried - and sometimes failed - to create a visual equivalent of Milton's poetry. Between the late seventeenth and early twentieth centuries a flurry of illustrated editions of Paradise Lost appeared. Apart from being beautiful artefacts in themselves, these books and their engraved plates are an invaluable sign of what Paradise Lost meant to the periods that produced them. 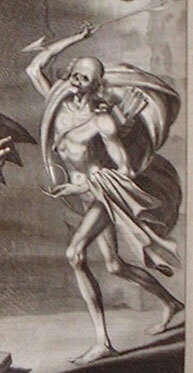 Satan, for example, looks very different in 1680 to how he looks in 1860. Along with the shifting tides of artistic taste came new ways of looking at Milton. Paradise Lost's early illustrators drew episodes from the poem with an eye for the emblematic: Satan as a cormorant sitting in the Tree of Life, the golden scales of justice in the sky over Eden. Like Milton himself, these artists looked at the visual world of God's creation and found it filled with deeper symbolism. In the eighteenth century, painters and engravers with a new-found passion for landscape began to look to Milton's epic as a storehouse of the Sublime - the rolling vistas of Eden, or the flaming, subterranean crags of Hell. By the nineteenth century, the age of Jules Verne and H.G. Wells, an artist such as Gustave Doré could produce his extraordinary science fiction image of Satan's flight to earth. 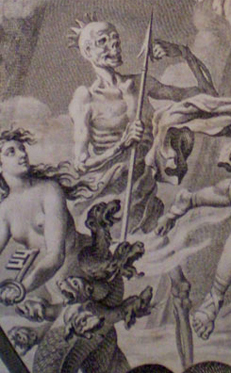 The fourth edition of Paradise Lost (1688) was the first to contain illustrations. Its twelve plates were designed by at least three different artists. Paradise Lost's illustrations have played an important part in shaping the poem we know today. Our story begins towards the end of the seventeenth century. Published by Samuel Simmons in 1667, the first edition of Paradise Lost had been a run-of-the-mill affair, even compared to Milton's earlier collection of shorter poems. The first copies were modest volumes with no portrait, no preface, no dedicatory verses. At first it sold very slowly, prompting Simmons to print several new title pages in an attempt to drum up interest at the bookstalls. The poem's popularity gradually grew, but by 1687, no new edition of Paradise Lost had appeared on the shelves for a decade. Milton seemed destined to be remembered as one of those great, unread English poets. In 1688, everything changed. 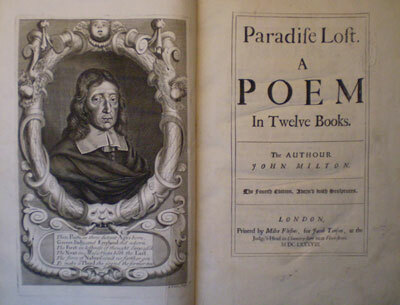 The publisher Jacob Tonson, whose list of fashionable contemporary authors included Dryden, Pope and Addison, obtained the rights to Milton's poem and grabbed the chance to turn it into a classic. That year he released the fourth edition of Paradise Lost, whose title page advertises it as 'Adorn'd with Sculptures' (then a common term for engravings). Unlike the previous editions, this one was large (about the size of a modern coffee table book), beautifully printed, ornamented with twelve full-page engravings by prominent European artists, and very expensive. At its head was a lavish portrait, whose accompanying epigram by Dryden compared Milton to the great classical poets, Virgil and Homer. In short, this book was monumental. A canny fashioner of literary identities, Tonson had realised that pictures sold books, and in doing so, set Milton on the path to becoming a national classic. Browse the 1688 illustrations in our picture gallery. A curtain of fire: etching by William Strang, 1896. It is a commonplace to say that Paradise Lost has been a rich source of imagery for artists. But when we slip into talking about a poem's 'imagery', or 'images', what do we actually mean? As we read Milton's poem does a kind of revolving picture gallery of Hell, Heaven and Eden pass through our minds? Paradise Lost may be a fertile subject for illustrators, but it also presents them with some challenging difficulties. An unnatural light: engraving by John Baptist de Medina [? ], 1688. In words like 'views', 'sights', 'visible' and 'ken' (now a rare word that means the range of someone's vision), Milton is repeatedly telling us that there is something to see here. First he sketches out some of the traditional topography of Hell: it is 'waste and wild', a 'dungeon horrible' filled with fire. But as so often in Paradise Lost, Milton's description of the scene turns upon a simile - 'As one great furnace flamed' - and, more particularly, upon the following word 'yet'. Milton's simile conjures up before the mind's eye the image of a roiling furnace, before saying 'no, Hell is not as simple as this'. We can only see Hell's fires by putting together in our imaginations two things that, in reality, are totally opposed. This is what Milton does in the famous oxymoron that gives this website its name: 'darkness visible'. Illustrators of Paradise Lost have tried in various ways to represent these infernal fires. 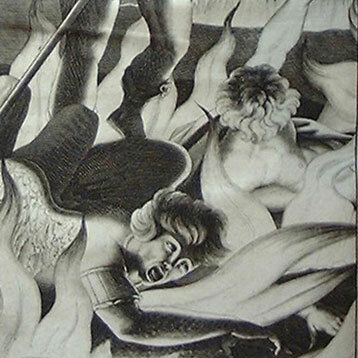 The artist of the 1688 edition tips his flames with black, bathing the fallen angels in a stark, unnatural light. William Strang's etching of 1896 creates a billowing curtain of fire that engulfs the whole composition. Yet what these efforts demonstrate, perhaps, is how unequal the human mind is to the task of imagining a region fiercely illuminated by the absence of light. In Book V, Adam asks the angel Raphael to describe the fall of Satan. Raphael finds himself in the same difficulty that Milton faces: 'how shall I relate | To human sense the invisible exploits | Of warring spirits' (V.564). Raphael soon resolves to make his tale more comprehensible to Adam and Eve by 'likening spiritual to corporal forms' (V.573). Death does have some iconographical attributes: it sports a 'dreadful dart' and 'kingly crown'. But they are certainly not the traditional ones of the danse macabre, with its robed skeletons and scythes. Milton's threefold repetition of 'shape' underlines the fact that this limbless entity is constantly shifting out of vision and substance. 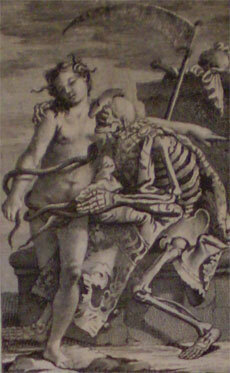 However, the majority of illustrators over the centuries have chosen to depict Death in his customary skeletal guise. Such are the pressures of artistic tradition on the one hand and the visual medium on the other, that the engravers override Milton to create a firmly 'corporal form'. John Baptist de Medina [? ], 1688. 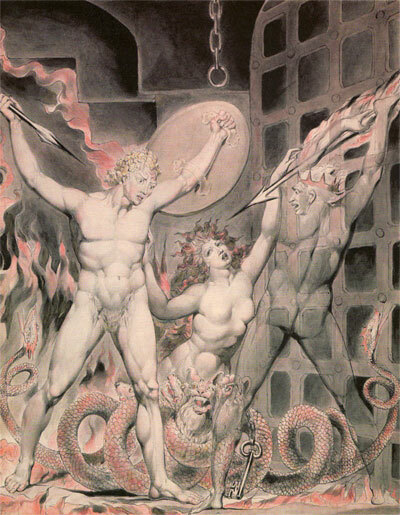 William Blake, Satan, Sin and Death, 1808, watercolour. We can learn a lot by comparing how different artists have tackled the same Miltonic scene. Each picture throws a different light on the passage, picking out and suppressing different aspects of Milton's description. 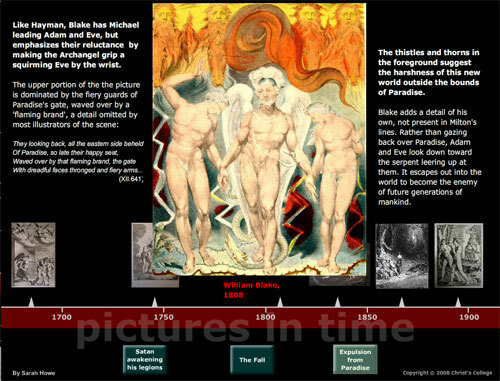 The following interactive popup, Pictures in Time, compares versions by different artists of three key scenes spread through the course of Paradise Lost: Satan rousing the Fallen Angels (Book I), the Fall (Book IX), and the Expulsion (Book XII). 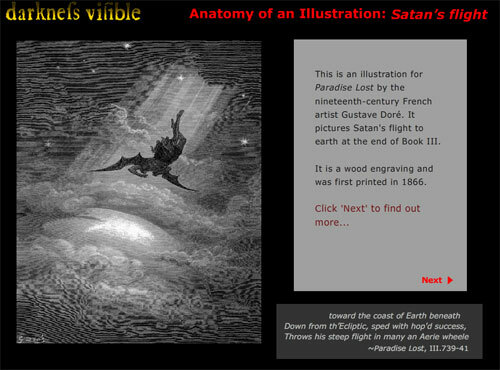 The following popup, Anatomy of an Illustration: Satan's Flight, takes an in-depth look at a single illustration by the nineteenth-century French artist, Gustave Doré. Satan's flight to earth at the end of Book III has never been a popular subject among artists, making Doré's version all the more unusual. Robert Woold, Howard J.M. Hanley, Stephen Hebron, Paradise Lost: the Poem and its Illustrators (Grasmere: the Wordsworth Trust, 2004). The best introduction to Paradise Lost and its artistic interpreters, this beautifully illustrated book started life as the catalogue of a Wordsworth Trust exhibition in 2004. It charts a fascinating path through the most celebrated artists to tackle Milton, setting them alongside some lesser-known gems. Marcia R. Pointon, Milton and English Art (Manchester: Manchester University Press, 1970). Pointon's book is still the place to go to explore Milton's poetry as a source for eighteenth- and nineteenth-century English art. Even a brief skim through the illustrations gives a vivid sense of what Paradise Lost meant to these different periods. Stephen C. Behrendt, The Moment of Explosion: Blake and the Illustration of Milton (London: University of Nebraska Press, 1983). A more in-depth and scholarly look at Blake's illustrations. The second half is a detailed comparison of Blake's 1807 and 1808 Paradise Lost watercolours (complete with full-page colour prints), showing how his ideas changed and developed.